Ah, summer. The only season when the train is basically a sauna, sunglasses are the most important accessory, bocce ball constitutes as a socially acceptable Friday night plan, and the only app you ever need to check the temperature outside is Snapchat. But, as any sun-kissed, seafaring individual well knows, your summer is only as cool as the raft with which you ride the season out. In the olden days, a simple rectangular float would have sufficed as suitable in-pool (or open-ocean) transportation. Then, as astute millennials slowly realized that doing absolutely nothing all summer seemed decidedly justifiable if you spent your days hovering atop a stylish—or downright comical—floatie, came the buoyant pizza slices, emojis, and, of course, the granddaddy of them all, the iconic white swan. It’s true, poolside eye candy comes in many shapes and forms. And while we’ll always be Sunnylife superfans (because one ‘grammable floatie is never enough), we’re here to declare that the days of drifting aimlessly on the backs of inflated birds have come and gone. Why? Because we just found the chicest float yet. 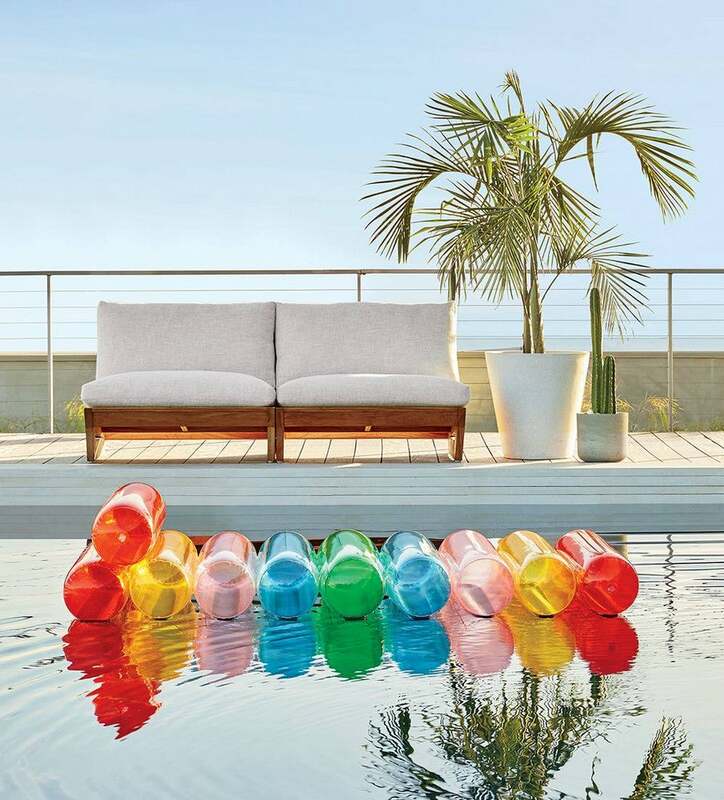 Introducing, the Love One Another Pool Party Float from CB2 (aka, the raft you’re going to see everywhere this summer). A vibrant vision in primary hues, the shapely float screams summertime bliss, and it’s the only raft we want floating our boat—er, bodies—this summer. It’s no secret that rainbow items are making a serious comeback, and nothing is sure to spread whimsy and delight quite like a floatie that, by name, doubles as a welcomed reminder to spread a little love. A product of Fred Segal’s second exclusive collab with CB2 (dubbed the “Pool Party Collection”), the maximalist-approved accessory serves as an irreverent take on 1970s poolside decor. Wondering why we’re talking pool floats when much of the Northeast is still buried under snow? When it comes to summertime floatation devices, there’s no such thing as planning too far in advance. Because while your friends are struggling to find a way to awkwardly straddle their metallic seahorse or climb into their partly-eaten doughnut ring, you’ll already be riding easy atop this stellar, cylindrical surface—leisurely floating your way to your best summer yet. And, no, you won’t just be doing it for the Insta. You’ll be doing it for the unparalleled joy it promises to bring to your life, and the lives of the swimmers and sunchasers around you. While we’re still open to other forms of transportation this summer—be it by plane, boat or car—you can be sure this will be our preferred vessel of choice. Even cloud nine has nothing on this ultra-mod raft.